Beginning in the 19th century, vocational schools and commercial shops in France and its colonies were outfitted with Roubo's famous Plate 11-style bench, but featuring metallic leg vise hardware instead of the wooden screws and forged fittings of Plate 11. French leg vise hardware of this type is typically made entirely of metal, whereas hardware from Britain and America usually features a screw with a T-shaped iron casting through which a sliding wooden handle passes. We designed ours around the French model for better function and looks. Researching extant vises and benches, we discovered a number of features that have all but disappeared from modern vise manufacture. We’ve incorporated these, plus a few of our own, into the design of the Classic Leg Vise. 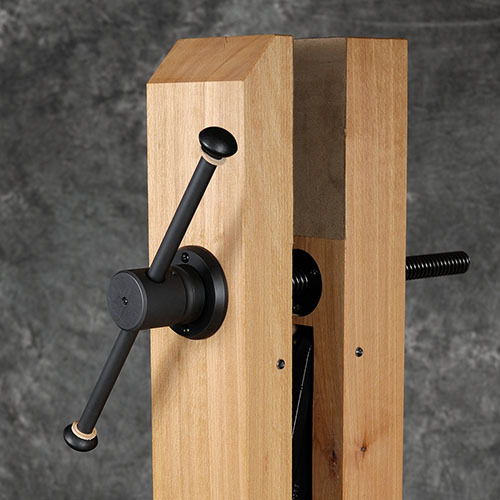 The Classic Leg Vise offers all the workholding capabilities of our flagship Glide Leg Vise. Here's how it differs. First, the traditional look will appeal to those looking for a more classic style. Second, the sliding handle and hub are lighter in weight than the Glide, so there is a bit more feedback when operating the Classic. The Glide does more of the clamping work "on its own" whereas one feels a bit more involved in the clamping process with the Classic. Both are excellent performers. Use aesthetics and cost as your deciding factors. Most modern vises use a single lead acme thread. Depending on pitch, these can function slowly, but with precision and control, or more quickly. We've found the sweet spot. Face vises are generally used for a relatively narrow range of thicknesses, but when used in more open positions, the convenience of opening the jaws quickly and efficiently is a plus. The Classic uses the same double-lead acme screw as our Glide Leg Vise and moves as fast as typical wooden vise screws, ½” of travel per turn. The mating surfaces of the flange and hub are machined to a 5” radius. This allows the parts to nest together and distribute clamping pressure over a wider area, especially when holding slightly non-parallel work. 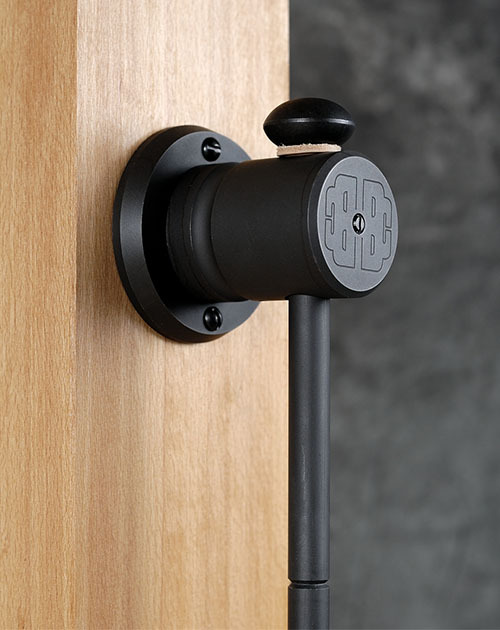 The sliding handle is machined with a v-groove detent centered along its length. 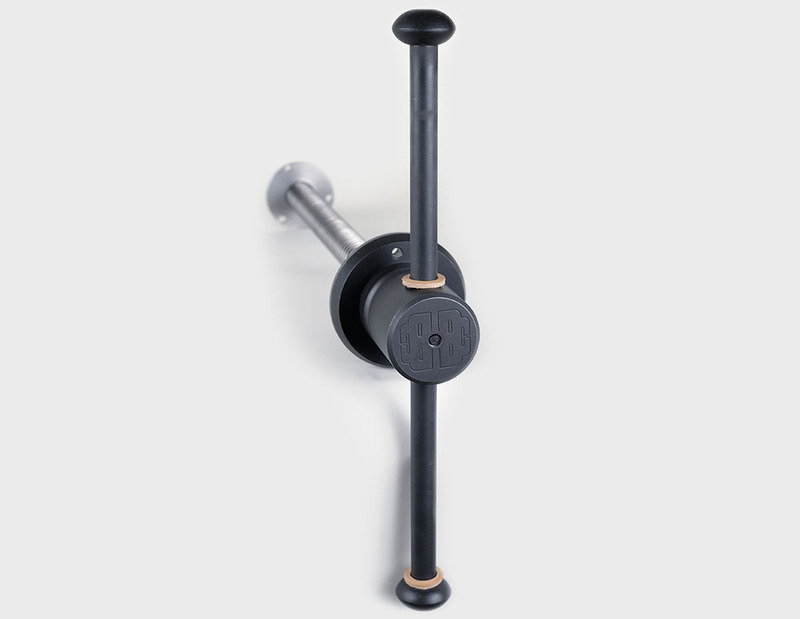 This detent engages with a stainless steel spring plunger in the center of the hub, allowing one to quickly center the handle and thus balance it to spin rapidly for quick, gross adjustments. In most cases, one can leave the handle centered after holding your workpiece. The spring plunger tension is adjustable. A tighter setting makes it easier and quicker to center up the handle, but may inhibit the handle from sliding as freely. There is a sweet spot that allows quick engaging with the spring plunger, and free sliding simultaneously. The plunger can be completely disengaged if desired. The spring plunger also allows repositioning of the handle so it’s not interfering with your work or your body. Leather shock washers further refine the handle’s function. 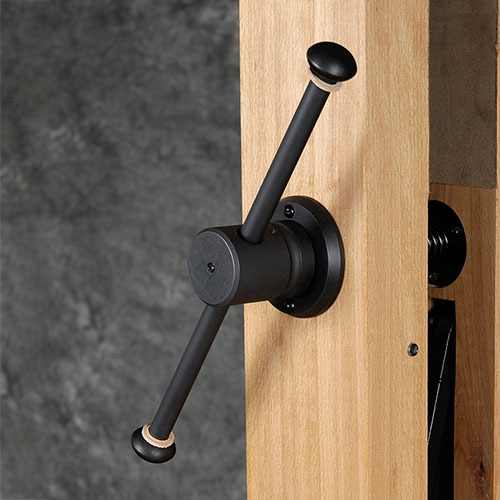 The Classic is made from machined steel and finished to echo the look of darkly patinated forged hardware. To achieve this we Parkerize the handle, hub and flange. Commonly used on high quality hunting rifles, Parkerizing (or manganese phosphate) is a process which darkens the raw steel, which is first sandblasted, while also providing wear resistance and lubricity. The process is more expensive than black oxide, yielding a more durable surface with an attractive dull black-gray look. A rub down with fine steel wood and a coat of light oil helps give the parts a vintage look, further lubricate, and provide excellent corrosion protection. See our installation instructions for further details. The Classic will work well for angled leg vises, as found on English-style workbenches. Because of the off-vertical forces placed on the Crisscross mechanism, you'll experience a slight reduction in friction-free action. The vise still moves freely in and out, just a bit less than a completely vertical leg vise. We don't recommend building your vise any more than 15 degrees off the vertical axis if using the Classic Crisscross. The Classic is designed to be used with the Benchcrafted Crisscross for best function. 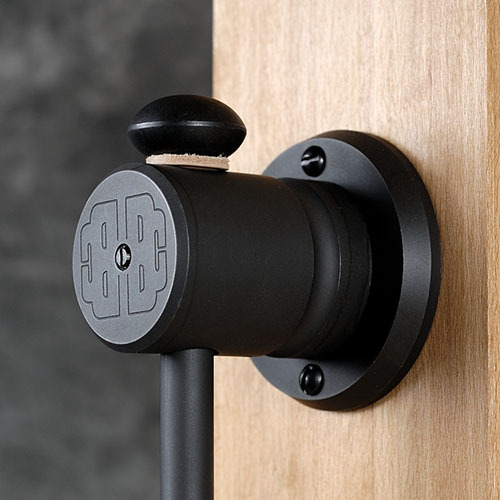 The Crisscross completely supports the weight of the Classic hardware and a wooden chop while completely eliminating the need to adjust a pin (as in a parallel guide). With proper installation, the Classic with Crisscross operates with virtually zero friction. We also offer the Classic Leg Vise without a Crisscross for those building different types of vises such as a leg vise with parallel guide, angled leg vises, twin screw vises, etc. Please note that we only provide instructions for installing the Classic Leg Vise with a Crisscross. Rolled-thread carbon steel double-lead acme screw with 4 tpi pitch for rapid movement & positive clamping pressure - 1/2" travel per revolution. 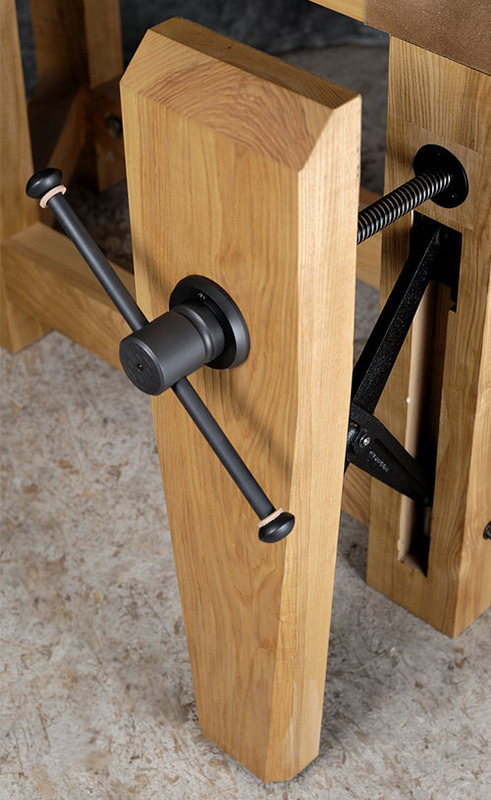 Attaches to the bench leg and chop with two 3/8" steel mounting pins. These holes are most accurately drilled using a drill press, so choose this model if you're building a new bench, and can work on the bench leg at the drill press. 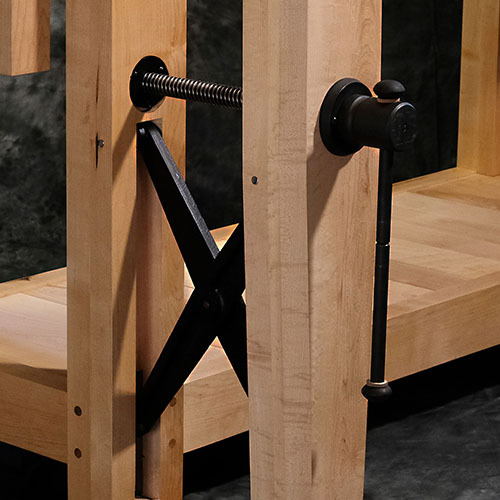 Features two cast iron brackets which house short pivot pins that attach to the arms. You don't need to drill any holes for pivot pins with the Retro, which makes it a better choice if you're retrofitting a bench with a Crisscross. My vise parts are a dull black/gray and have some marks on them. Is this right? The parkerized finish may arrive with a dull grayish cast. This is normal. There may also be some white marks that look like scratches on the parts. This is from handling the parts when we package them. The surface is sandblasted and easily takes light scuff marks.This is normal, and intended. The look of the vise is intended to reflect a vintage, patinated aesthetic, so feel free to leave it as is when you unpack it. The vise pictured above (and elsewhere on our site) was rubbed down with 0000 steel wool and lightly oiled, as per the instructions on page 11 of the Classic Leg vise Installation Instructions. As you use and handle the vise, it will develop a patina of its own. As with any steel part, you will want to protect it from rusting with a light oil. The parkerizing helps, but a thin coat of oil is part of the finish, and will need to be refreshed periodically. If you use the vise frequently, your natural hand oils should be sufficient. You can also apply a drying oil to the exposed areas of the parkerized parts (do not apply any drying finish to the dished part of the flange or hub.) We recommend Tru-Oil. 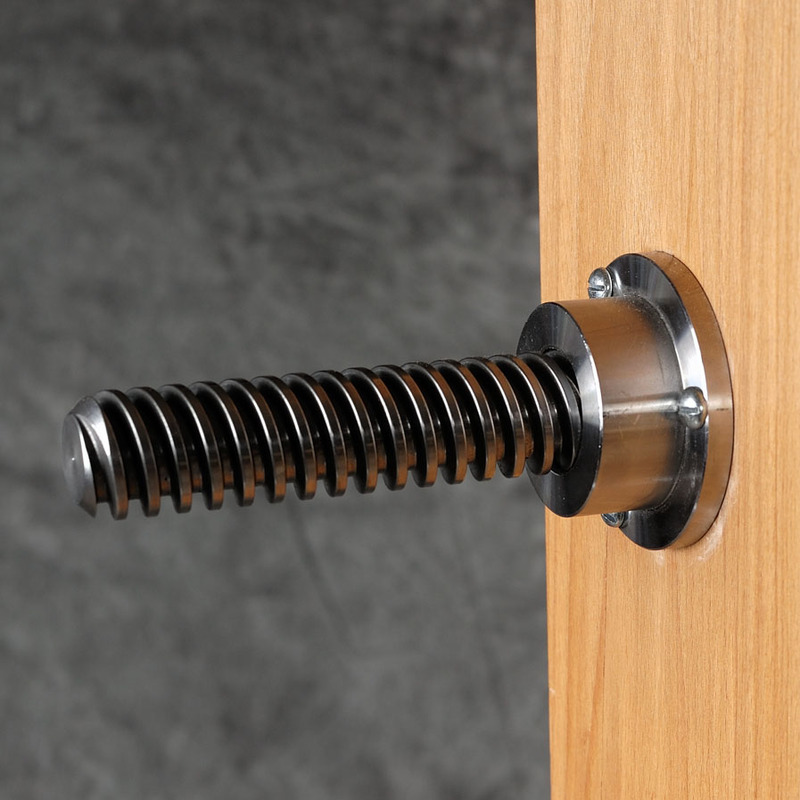 Whatever you apply to the sliding handle will eventually wear off with normal use, including the parkerized finish. We designed the finish so it will rapidly develop a vintage, classic look.